Senior Nick DeCenzo was ranked No. 10 in the state in scoring during the regular season, one place behind teammate Adam Johnson (Photo by Tim Kolehmainen). It’s an experience to sit back and watch Adam Johnson wheel and wind his way through a defense. It’s easy to marvel at the crisp passing and smart play of Nick DeCenzo. It’s inspiring to watch the toughness and hard work of Joe Anderson. 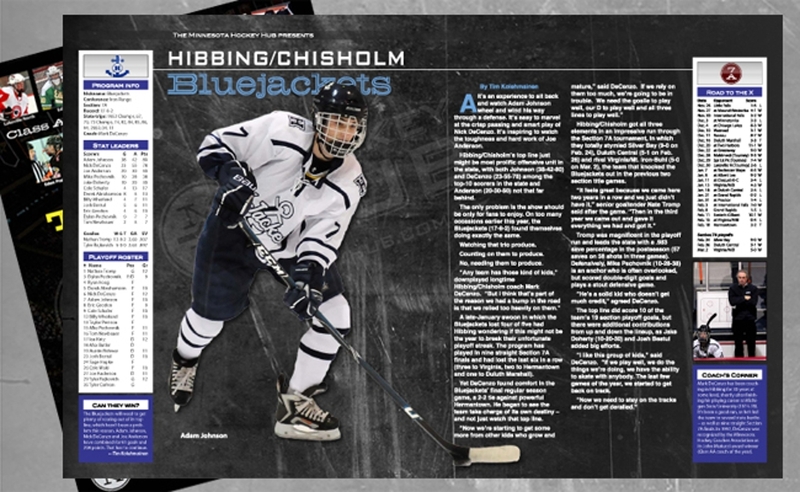 Hibbing/Chisholm’s top line just might be most prolific offensive unit in the state, with both Johnson (38-42-80) and DeCenzo (23-55-78) among the top-10 scorers and Anderson (20-30-50) not that far behind. The only problem is the show should be only for fans to enjoy. On too many occasions earlier this year, the Bluejackets (17-9-2) found themselves doing exactly the same. Counting on them to produce. No, needing them to produce. A late-January swoon in which the Bluejackets lost four of five had Hibbing wondering if this might not be the year to break their unfortunate playoff streak. The program has played in nine straight Section 7A finals and had lost the last six in a row (three to Virginia, two to Hermantown and one to Duluth Marshall). Yet DeCenzo found comfort in the Bluejackets’ final regular season game, a 2-2 tie against powerful Hermantown. He began to see the team take charge of its own destiny – and not just watch that top line. 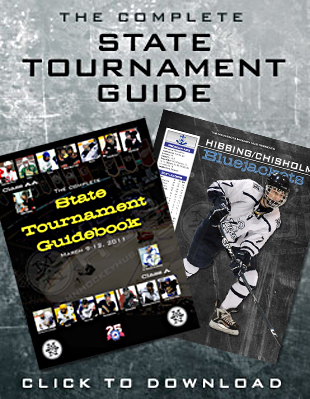 Hibbing/Chisholm got all three elements in an impressive run through the Section 7A tournament, in which they totally stymied Silver Bay (9-0 on Feb. 24), Duluth Central (5-1 on Feb. 26) and rival Virginia/Mt. Iron-Buhl (5-0 on Mar. 2), the team that knocked the Bluejackets out in the previous two section title games. Tromp was magnificent in the playoff run and leads the state with a .983 save percentage in the postseason (57 saves on 58 shots in three games). Defensively, Mike Pechovnik (10-28-38) is an anchor who is often overlooked, but scored double-digit goals and plays a stout defensive game. “He’s a solid kid who doesn’t get much credit,” agreed DeCenzo. The top line did score 10 of the team’s 19 section playoff goals, but there were additional contributions from up and down the lineup, as Jake Doherty (10-20-30) and Josh Bestul added big efforts. “I like this group of kids,” said DeCenzo. “If we play well, we do the things we’re doing, we have the ability to skate with anybody. The last few games of the year, we started to get back on track. The Bluejackets will need to get plenty of scoring out of its top line, which hasn’t been a problem this season. Adam Johnson, Nick DeCenzo and Joe Anderson have combined for 81 goals and 208 points. That has to continue. Mark DeCenzo has been coaching in Hibbing for 30 years at some level, shortly after finishing his playing career at Michigan State University (1974-78). It’s been a good run, as he’s led the team to several state berths -- as well as nine straight Section 7A finals. In 1997, DeCenzo was recognized by the Minnesota Hockey Coaches Association as its John Mariucci award winner (Class AA coach of the year).